Search and adopt a Pekingese near you. The Pekingese or Peke also referred to as "Lion Dog", "Pelchie", or "Fu Dog" is an ancient breed of toy dog, originating in China. They were the favored pet of the Chinese Imperial court, and the name relates to the city of Beijing. The breed has several characteristics and health issues due to its unique appearance. The Pekingese breed is over 2000 years old and has hardly changed in over all that time. One exception is that today’s breeders and dog-show judges seem to prefer the longhaired type over the more-traditional spaniel-type coat. The Pekingese's flat face is one of the breed's most obvious of characteristics. The body is compact and low. The legs are noticeably bowed and can restrict the Pekingese's movement. The Peke's unusual rolling gait may have been deliberately bred to prevent the Imperial court dogs from wandering. Pekes weigh from 7 to 14 lb. (3.2 to 6.4 kg) and stand about 6–9 inches (15–23 cm) at the withers, however they can be smaller. These smaller Pekes are commonly referred to as "Sleeve" Pekingese. The name is taken from ancient times, when emperors would carry the small breed in their sleeves. 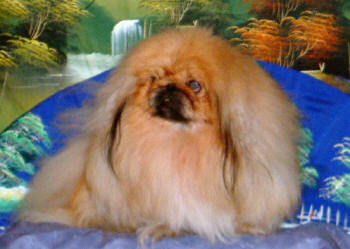 A Pekingese over 14 pounds is disqualified for show in the ring. The leading cause of death for Pekes, as with many other Toy breeds, is congestive heart failure. When diagnosed early and successfully treated a Peke with this problem can expect to live many years. A heart murmur is a potential sign, and must be evaluated by a veterinary cardiologist. Very often, the problem does not surface until the dog is 6 or more years old, so it is difficult to screen the problem in a pup. Pekes' other main troubles are eye issues and breathing problems, resulting from its tiny skull and flattened face, skin allergies, and hotspots. An especially common problem is eye ulcers, which may develop. Pekes should never be kept outside as they can develop breathing problems, which makes it difficult for them to regulate their body temperature in overly hot or cold weather. Their long backs, relative to their short legs, make them vulnerable to back injuries. Care should be taken when picking them up, to give Pekes adequate back support: one hand under the chest, the other under the abdomen. Short legs give some Pekes difficulty with stairs; older dogs may not be able to go up or down them without assistance. (UK) significantly changed the breed standard. In October 2008, removing the clause that the "profile [should be] flat with nose well up between eyes" and adding instead the "muzzle must be evident". This was in response to public opinion following the BBC program, Pedigree Dogs Exposed. The breed standards of two other flat faced dogs, the Pug and English Bulldog, were soon also changed. Keeping the Peke coat healthy and presentable takes daily brushing. If you do this, they will need to see a groomer only every 3 months. If a Peke becomes dirty, it is recommended to take it to a groomer as soon as possible, as it is difficult to remove dirt from its coat once it has dried. This can be avoided by brushing regularly, especially the belly, and in between the front and hind legs. One important thing for new owners to remember is that this dog is intended as a house pet and may be kept in a puppy cut which is far more low maintenance than a show cut. It is also important to remove dirt from the eye pores daily, and from the creases on the face. Due to their abundant fur, it is important to keep the Pekingese cool. Pekes are indoor dogs and they are prone to having heatstroke when exposed to high temperature.